Mixing things up a bit! I wanted to take a moment to let everyone know what has been going on in the shop. I have been working on a set of three tables that I hope to have done in a couple of weeks. They are by far one of my favorite creations to date. I have been working on them for a couple months because life and commissioned projects have interrupted the completion of the set. On another note I started a Patreon page for a special project that I have been brainstorming for quite some time. I am preparing to put out ongoing videos for Youtube that are called Get Kids Woodworking. The whole purpose is to show people that you can create wood projects without fancy tools or a fancy shop. My biggest push for doing so is that schools have lost woodshops due to budget cuts around our nation. That being said I feel it is important for us as parents and as a society to pick up the slack. I hope that as this project gains momentum I can have guests in the shop(especially youngsters) to help demonstrate basic skills that can create fun, functional items for them to enjoy. If you are not familiar with Patreon it is a crowdfunding site that helps creators using small re-occuring donations. My Patreon page is set up on a per video basis and my goal is to get $100 per video I put out. I will use these funds to purchase a better camera and video editing software. If you feel inclined to help me out please click the link below. Once on the Patreon page you will see a couple of videos as well as a button to become a Patreon. Every person that supports my cause will be rewarded and those rewards are listed on the site as well. 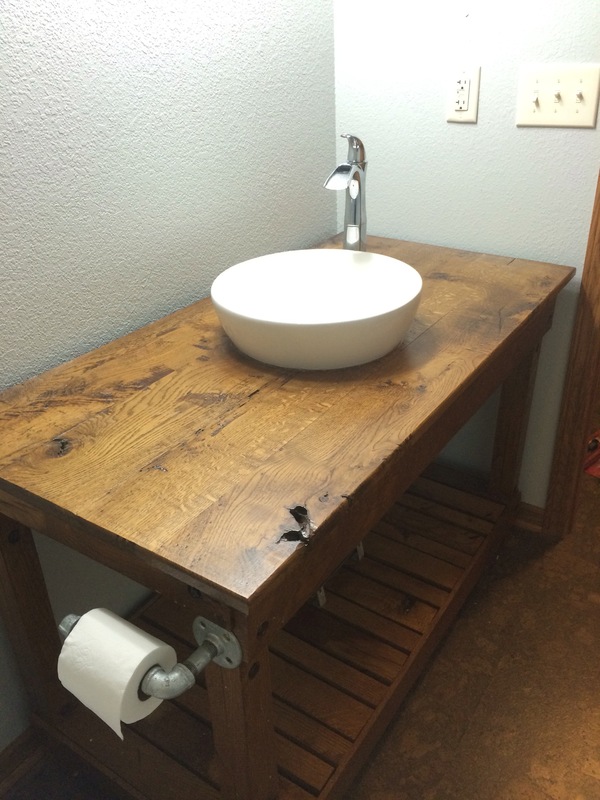 The woodworkers kid finally has a vanity! The basement vanity has been in the works for a short bit of time (at least in my mind, due to me not remembering when I started it). 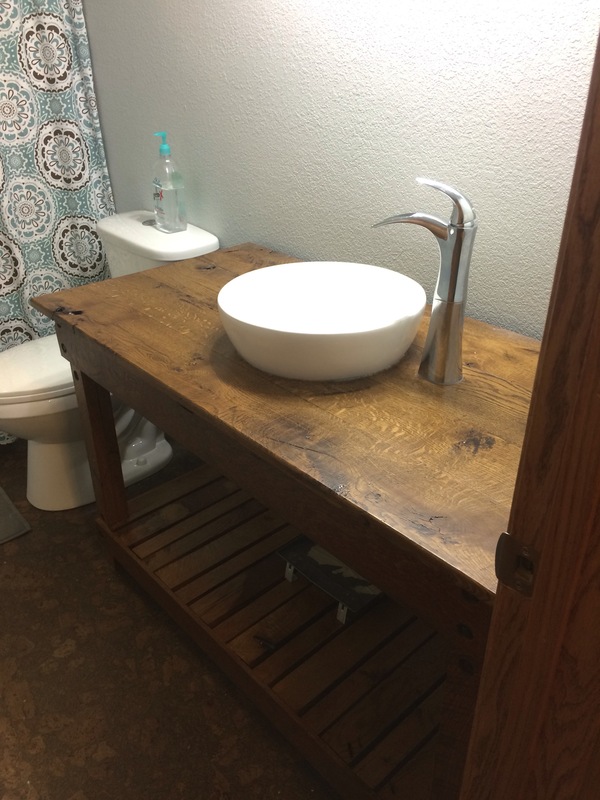 At any rate it seems as though the vanity was built and installed for the longest time without plumbing. For those who don’t know me I hate plumbing work. This piece is in our basement and the bathroom was only “roughed in”. That means doing plumbing for the vanity from scratch. I mounted the sink and cut/fit all pieces needed. Guess what happened.. Leaks, not major leaks but little seeping leaks in two or three spots. After some futzing around I got all the leaks tamed and decided to put a fork in this project. Now onto the vanity. It is all solid oak from the family farm, finished with Sherwin Williams fruitwood stain and several coats of poly. The sunken vessel sink is from Aquasource and finished off with a Delta faucet. All in all the piece looks and feels great and should last a very long time. Now all I need to do is frame a mirror and install a galvanized towel rack to match the galvanized tp holder. Thanks for reading and feel free to contact me if you have a similar project you would like built. Here is the little side table that I recently made from my customers home renovation scraps. The legs are tapered in the middle and it wasn’t finished to a fine point. It was a fun little project especially considering all the stock was sitting in the basement doomed. I brought it back to life and have given it purpose in being. Lately I have been reading a lot of information about artistry in woodworking. I have listened to interviews, read articles, and studied many pictures regarding greats like Maloof, Gilmartin, Galbert, and others. Tonight as I was working on my latest commissioned project I felt inspired to try a little artistry. The project is a basic bedside table. My client had some oak plywood, 1″ base shoe, and cove left over from some home remodeling projects and asked if we could make it work. I started with some square legs, mortise and tenoned some upside down base as aprons, and use the plywood and upside down cove for the top. Feeling inspired I decided that the legs couldn’t just be square. I grabbed one of my hand planes and started a funky chamfer on the legs after assembly. It is a mild tapered chamfer to make the legs thinner in the middle than on the ends. I’m anxious to see how it looks once the quarter sawn legs get hit with stain and finish. Well we have been churning out work and right now I’m in the middle of a very cool repair/refinish project that is quite time consuming but well worth it once the finished piece will roll out. It is a surprise for someone so I cannot divulge too much information. I have been stoked to work on the project and it is coming along nicely. In other exciting news we are trying to find a commercial space to move our workshop into. Our goal is to have a workshop and showroom so that our customers will have a place to see, touch, feel, and get inspired by our projects. We have a space in mind and we are patiently waiting to see if all the fine print works out. We are hoping to have something in place in the next couple of months. Either way once it happens we will have an open house that will be a good time for all. Stay tuned for details. When I started on this project it was just a culmination of ideas running through my head. 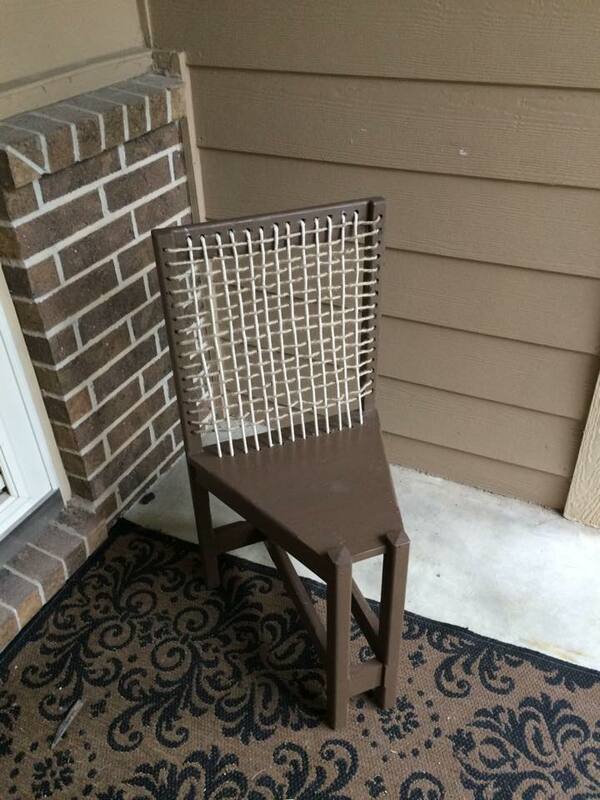 I wanted to keep a simple chair. My lovely bride accuses me of having a chair fetish. If we are walking through antique stores I always stop and inspect every chair to see if it is something that I would be interested in. I love chairs! I have always said that it is perfectly acceptable to have simple chairs sitting around for people to use. I wouldn’t want a simple shaker chair to sit in all the time but if I go to visit someone I don’t expect to have a chair like I have at home for me. Everyone has their chair.. you know the one that has formed itself perfectly to your behind, the one that has character, the one that speaks to you. Personally I have a Morris chair in the basement that is my comfy chair. That is not what I was going for here. I was going for a simple chair that could be used when all the other chairs are spoken for. I wanted something small, comfortable, and lightweight. I have always been fond of shaker furniture for the functionality of their designs. I prefer a squarer look in chairs than the traditional shaker design. There was a second thought in my mind while designing this chair. I have played guitar for years and everyone knows that a stool works well for playing guitar. I wanted a chair that would allow for changing positions and to accommodate a guitar player better than the typical chair. This is why I narrowed the front of the seat. In doing so it also made the chair more comfortable for short folks and tall folks alike. There isn’t a seat to determine where your legs should be. I have observed my sons who like to hang their legs off the sides of a chair, with this one it makes it comfortable to do so. As I was finishing up the little unique chair I decided to do something different with it. I talked to my bride and the family and we decided to auction the chair off and all proceeds would go to the Wichita Childrens Home. The boys loved the idea of shopping for kids that could use a lift me up. I think these kinds of actions are what will help create character in my sons for the future. I was very pleased with the outcome of the project even though I know it is funky and different than most chairs. At any rate if you would like to help out the Children’s home you can bid on the chair on our Facebook page. The link is below. 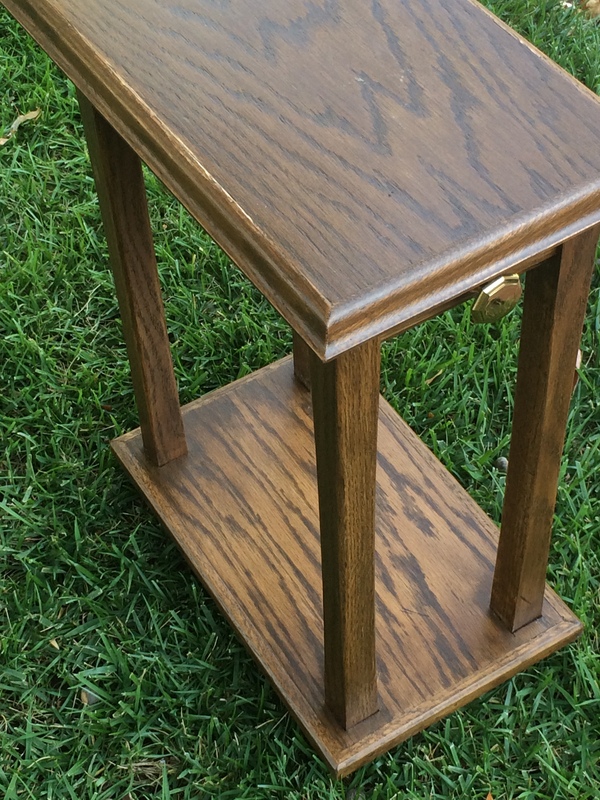 Thanks for reading and I hope you like “Steves silly strung shaker inspired stool seat”..
Bid on the chair by clicking below. Feel free to contact us with any upcoming projects you would like to discuss. The big ball is rolling! Round and round we go. Where we are headed no one knows. Liz and I have had several special requests for signs come in. It is exciting and fun to see the work. I am totally blessed to have such a great partner in all of this. It is awesome to see her craftiness and workmanship. As things go the boys are getting more and mor interested in the tools, ideas, and learning in the shop. I guess in my opinion it just feels right. A couple of days ago I had my youngest son (4 years old) in the shop with me. He pretty much walked around asking questions about this and that and making observations about my tools. He is a very sharp 4 year old and he seems to be a building type of personality. He goes crazy with the lego sets we have purchased. The other day we bought him a box of jigsaw puzzles that we figured would keep him busy for awhile. He blasted through them very quickly and Liz and I were amazed at how fast he put 4 puzzles together that had 48 pieces each. 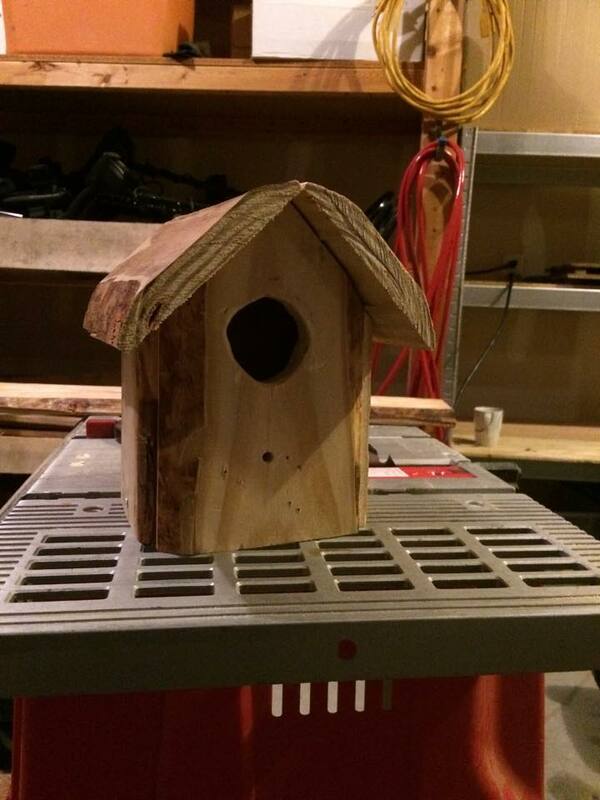 Anyways after I had got done building the sign blanks for Liz to paint he wanted to start building a birdhouse. I mentioned to him that we would need a floor for the birdhouse. We got busy and glued up a couple of pallet pieces for a birdhouse floor. We left it in a clamp overnight for the glue to dry. A couple days later I was leaving work and I saw a pallet down the alley that caught my eye. 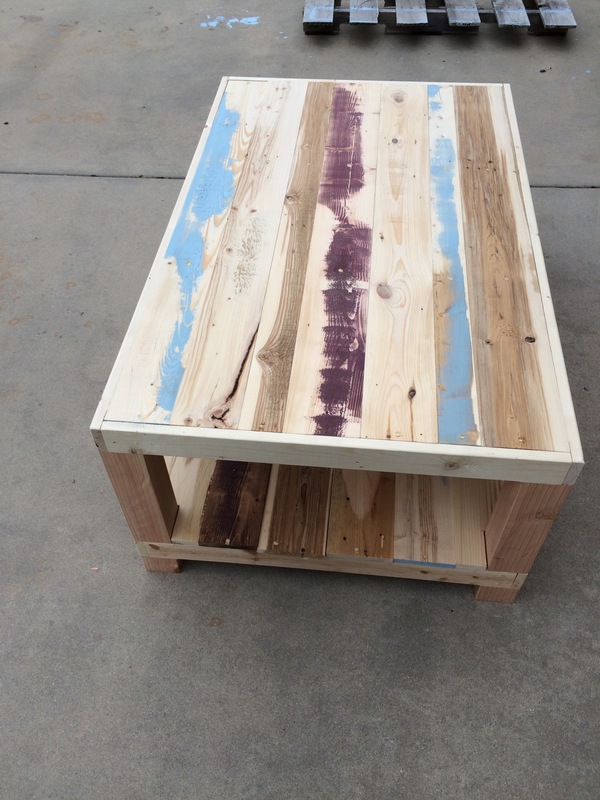 It was a simple pine pallet but it was sitting in a way that I could see a bunch of live edge wood on it and that it was in good shape. My mind quickly envisioned the outside of the birdhouse. I skidded to a halt and threw the pallet onboard for the commute home. 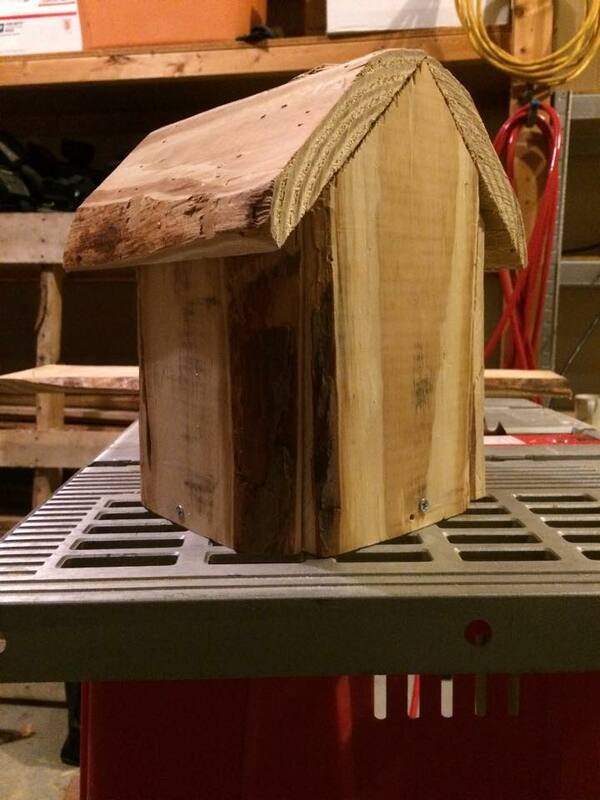 Last night My oldest son and I spent some time in the shop figuring out how to cut 45 degree angles for the peaked roof and figuring out how to make the live edge lumber sturdy enough for the birdhouse while keeping the live edge. We got all of those issues figured out and it came time to cut the entry hole. I was stoked about this because the day before my lovely bride had presented me with a Porter Cable jigsaw for my birthday. It worked well and I wasn’t too careful because I didn’t want the hole to be perfect. After I drilled and sawed out the hole Kolton used the Dremel to clean it up and remove some splinters. We assembled the pieces and then called it a night. I have to say that I have know idea if the business will ever take off and be a success but it doesn’t matter. I am totally happy having my wife involved and being able to introduce the boys to the joy that can come from woodworking. As for the birdhouse pictures are below. I think with the efforts made by the boys on this one we will have to keep it around the house. I have enough of that pallet left to maybe make one or two more. I am really enjoying the fact that if you grab a pallet and then build something out of it you are not 100% sure what to expect. I have several pallets that are mixed species and have different levels of character. I have seen many pallets in dumpsters headed for landfills and I guess that bugs me a bit. Why throw it out if you can make something useful out of it while spending time with the people you love and doing mother earth well. The live edge just adds a little something to it. All we need is a twig perch and a way to hang it. It reminds me of a tiki hut. Yesterday morning Liz and I went to the hardware store early and bought some supplies for a few projects. When we got home she started on a rustic, reclaimed “Love” sign. As usual I think she did a great job on it. She used a Cranberry paint with Manila rope for the O. Later in the day I worked on a reclaimed bench that will be ready today. 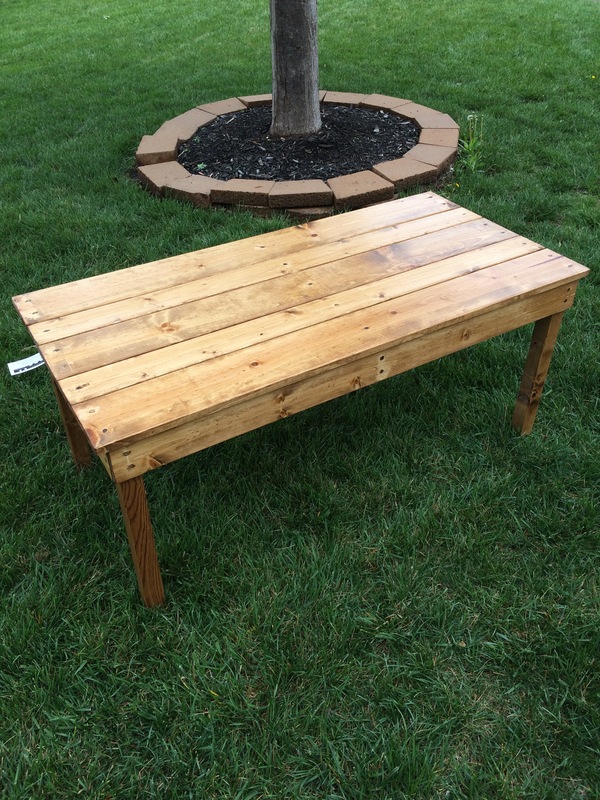 My original thought was a little bench for an entryway. It seems to be a very versatile sized piece. 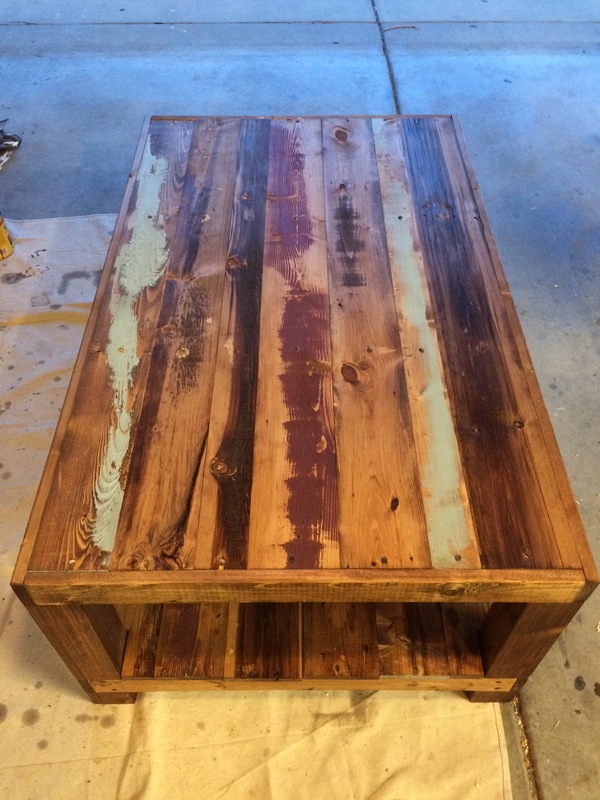 It seems like it would make a good coffee table or bench. Be sure to keep an eye on our available projects page for the latest items coming out of the shop.